What goes around comes around. 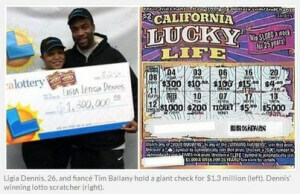 A hairdresser from Los Angeles bought three California Lucky Life Scratchers tickets, then gave two of them to her mother and her brother. When a homeless man asked for change, she almost gave away her last ticket, but decided not to at the last minute. When she had that last ticket checked, she found that she had won not only $1000, as she initially thought; she had actually won a prize that pays $1000 a week for the next 25 years. That totals to $1.3 million. The first thing on her mind is to pay of her loans, including her student loans. Then she hopes to realize her dream of having her own salon. She also wants to consult a financial adviser on whether to opt for a single lump sum payment or get the full amount over 25 years.